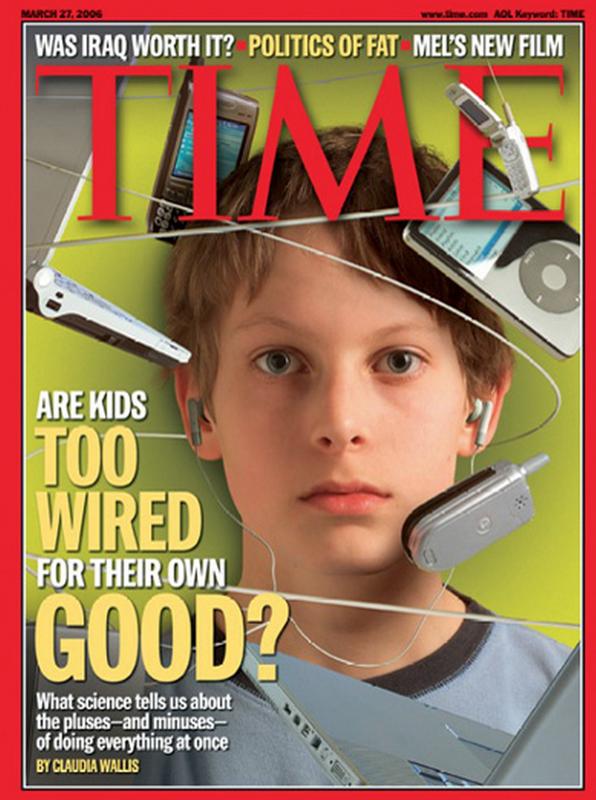 In late March, Time magazine featured an excellent article about the ill-affects of personal technology on Junior High, High School and College age students entitled, The Multitasking Generation. The subheading of the article’s title reads, “They’re emailing, IMing and downloading while writing a history essay, what is all that digital juggling doing to kids’ brains and their family life?” The article then proceeds to answer this question. The article opens with the a typical scene from the Cox family: at 9:30pm, while the mom, Georgina, is tidying up the living room, and the dad, Stephen, is ‘wolfing’ down dinner alone in the kitchen, their two children, Piers (their 14 year-old son) and Bronte (his twin sister) are engaged in various projects on two separate computers. Piers has been ‘holed up’ in his bedroom and logged onto MySpace and AOL Instant Messenger (IM) for the past three hours while downloading pictures and jamming to his iTunes. Bronte, having ‘commandeered her dad’s iMac’ is feverishly IMing while talking on her cell phone and ‘chipping’ away on homework. In the case of the Cox’s (who, unfortunately, probably typify many American families), after the parents and children arrive at home, the children are immediately engaged in their personal technology; usually at the expense of any real conversation with their parents or simple courtesy; half the time Piers and Bronte ignore their father and don’t stop what they are doing to offer any form of welcome. This kind of technological multitasking also appears to have a negative impact on a student’s ability to think. While students are able to make “brilliant use of media” in their college presentations, the “habit of grazing among many data streams leaves telltale signs in their writing, according to some educators.” A professor at Stanford observes, “The breadth of their knowledge and their ability to find answers has just burgeoned, but my impression is that their ability to write clear, focused, extended narratives has eroded somewhat.” College professors are even assigning their students fewer full-length books and more excerpts and articles in order to “adjust” to this generation’s learning habits. Apparently, the ability to sustain thought over a long period of time has decreased, even among college students! Also, when students are so “plugged in” it often takes away from other activities. An informal poll of 60 students discovered that the majority of those students were concerned that the blur of multitasking was taking away from exercise, sleep and meals. In one of the closing paragraphs, the article makes the statement, “…it’s valuable, even essential, to occasionally slow down, unplug and take time to think about something for a while.” No kidding! If students are not trained to do this, the long-term implications could be disastrous. The future leaders of this country will be unable to think, write, or read well. But I also think there is a spiritual component to this kind of multitasking, especially as it involves technology. Inherent in this kind of multitasking is the indulgence in stimuli. An indulgence that keeps students away from dealing with what’s really going on inside of them. If they can fill every moment with cell phone conversations, music, IM, movies, etc., then they will never be left with the frightening, yet substantial, questions of life and the world. If they can immerse themselves in the superficial, they never have to be confronted with any thing of real significance. They will be hollow their whole life long; to the detriment of their souls.